This brand new development has been offered by DR Horton Homes, one of the country’s largest and most respected builders. Conveniently located where Highway 501 and Highway 31 meet, these gated homes are just far enough out to avoid much of the heavy traffic and hubbub, yet minutes to all that Myrtle Beach has for entertainment as well. The 3 bedroom Carillon at Tuscany homes combine luxury, livability and great amenities in one of the area’s top gated communities for active adults. 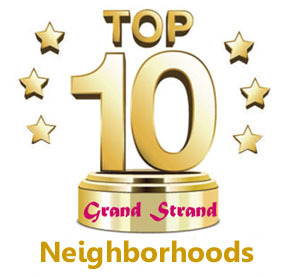 With eight floorplans to choose from ranging in size from 1,460 to 2,772 square feet in size, the single-family homes offer a level of luxury, location and lifestyle unlike any others in the Grand Strand. Homes range in price from around $180,000 to the upper-$200s. At the heart of the community is the clubhouse with a large pool, spacious sundecks, a game room with billiards table, movie theater, tennis courts and a state-of-the-art 2,000-square-foot fitness facility. Plus there are miles of hiking and biking trails as well as more than 40 acres of lakes ready for fishing. These great homes are also close to the Myrtle Beach Airport, the Coastal Grand Mall, the new Myrtle Beach Boardwalk, Tanger Outlet Stores, restaurants and the many outstanding attractions that have made Myrtle Beach one of America’s top places to live and play. And with more than 120 area golf courses, a great round of golf is never more than a few minutes away. Picture yourself in the good life in one of these or many other fine Myrtle Beach homes for sale and then call the Grand Strand specialists at Century 21 The Harrelson Group to get started on the best of the rest of your life.